A foot orthotic works best with an appropriate Orthopaedic shoe. A shoe must allow foot function and movement without being constrictive. Orthopaedic shoes provide extra depth, extra width, a firm heel counter, adequate cushion, and of course comfort. At Burnaby Orthopaedic we fit and provide orthopaedic shoes that provide a proper shoe fit and allow appropriate foot function. We carry various types of wound care shoes which off load any plantar ulcers (wounds at the bottom of your feet). We also carry many extra width, extra depth shoes which range in width from a B to 5E. 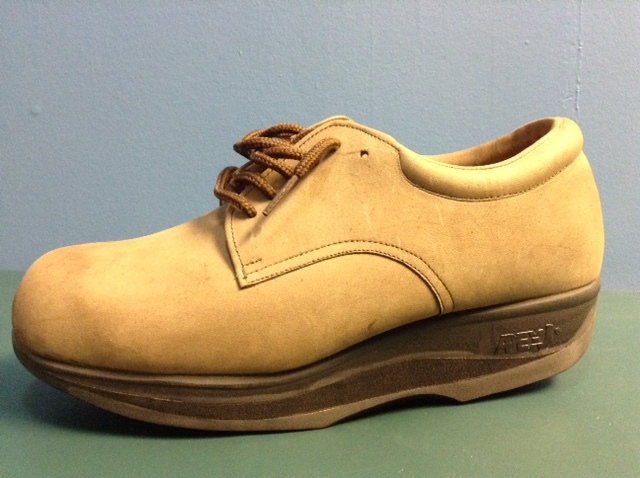 These shoes can be worn with foot orthotics, or AFO’s or KAFO’s. The brand names we carry are Propet, Apex, and Pedors. *Click on each logo to learn more. In some situations, people require modifications to their footwear and this can be done at our office. Some examples of modifications include: rocker soles, external heel lifts, sole widening (buttress, split sole, flare), shoe stretch, balloon patch, excavations, internal heel lifts, metatarsal support, etc. Many of these modifications are covered by extended benefits. Please check your benefits for full descriptions. If an off the shelf shoe or a modified shoe is not appropriate, we do cast for custom made shoes, but these are quite rare and cost $950.00-$2000. If you have extended benefits we suggest you read the description on your insurance very carefully to confirm exactly what type of footwear you are covered for.